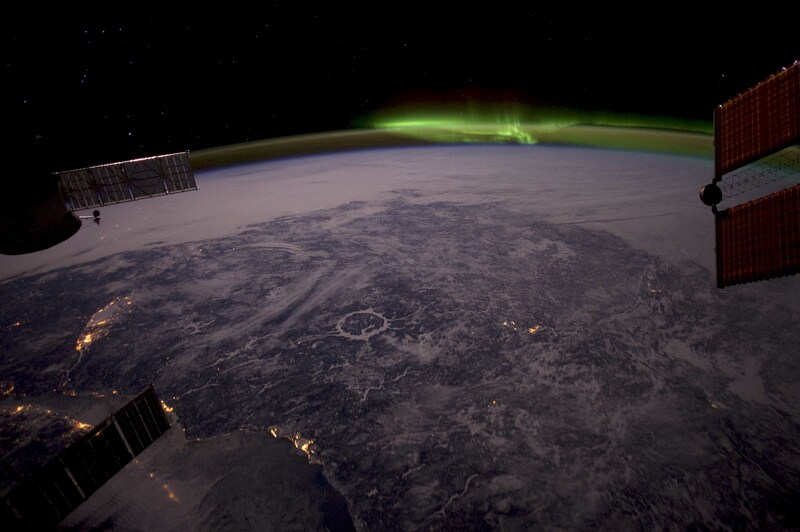 Astronaut Don Pettit posted this photograph on his blog on February 24th, noting “That’s Canada’s Manicouagan Crater near the center.” (Credits: Don Pettit). On this mission, Pettit is getting his fill of aurorae. 2012 has witnessed a dramatic increase in solar storms whose radiation and ionized particles spark the aurora effect. In the beginning of February, the Canadian Space Agency began a pilot program to photograph Canadian aurorae from the AuroraMAX observatory and the ISS at the same time. When an active aurora is expected, astronauts Don Pettit and Dan Burbank go on standby to catch images of the phenomenon from space while the public can watch live video feed from AuroraMax online. It is hoped that comparing images from Earth and from space will shed light on the formation of aurora and the forms they take. The first synchronized recording took place on February 7.